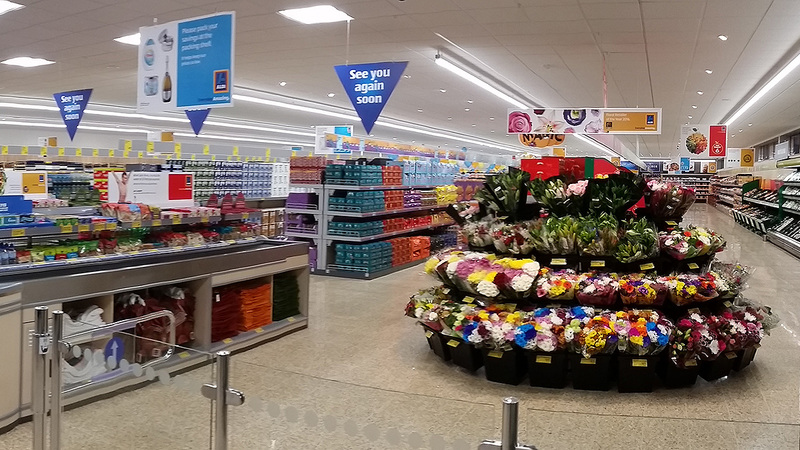 Sharman Projects | New Aldi store on Abbey Lane, Leicester, opens! The new Aldi store opened its doors on Thursday 27th October. Over 150 people turned up to see Olympic Gold medallist Scott Durant cut the ribbon whilst Aldi staff members handed out Golden Envelopes, containing tickets to win a range of prizes to excited customers who had queued ahead of the 8am opening. We were appointed by LondonMetric Property Plc as Fund Project Manager to oversee the works for LondonMetric. The project was undertaken by Hinton Properties and was pre-let to Aldi Stores Ltd with the design undertaken by STOAS Architects. The works involved the regeneration of the previously unoccupied site (circa 0.52 hectares) into an Aldi food store with associated parking facilities and soft landscaping. We undertook technical reviews of the works and costs working with the Hinton Properties team to monitor the construction works. The new Aldi benefits residents in the north of Leicester and the surrounding areas and creates approximately 40 new jobs, in addition to those created through construction and supply chain opportunities. We are pleased to deliver with the Project Team this successful project, which has regenerated the vacant site providing this commercially viable and sustainable retail offer.